The chief executive of the online taxi-sharing firm Uber has said he wants to make 2015 a year of rapid expansion in Europe. Travis Kalanick told a conference in Munich that Uber could create 50,000 jobs as part of a "new partnership" with European cities. 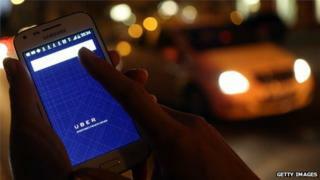 Fast-expanding Uber has drawn criticism across the world from regulators and established taxi operators. Mr Kalanick's comments were seen as a bid to build bridges with critics. Uber, which helps users summon taxi-like services on their smartphones, started four years ago and now operates in 250 cities worldwide. The San Francisco start-up is valued at $40bn (£25.5bn), based on the latest fundraising from investors. A woman in India who was allegedly raped by an Uber taxi driver is suing the company in the US courts. Some of the criticisms of Uber have provoked a combative response from the company, with Mr Kalanick a frequent critic of the red-tape and regulation that he says cities use to protect the interests of entrenched taxi firms. But Mr Kalanick told the DLD conference for the media and tech industry: "Uber is committed to establishing new partnerships with Europe's cities to ensure innovation, harness powerful economic benefits and promote core city functions." He acknowledged the need for rules and safety checks for drivers, saying it had been "easy to say something flippantly negative about every law" in the past. Uber is working with governments on new rules to ensure public safety is protected, choice and competition thrive and economic growth and tax revenue rise, the chief executive said. He said that Uber is developing new technology tools that improve safety and do background checks, and "improve communication with local officials and law enforcement. And he said that city authorities that free up Uber's service would see the creation of thousands of jobs and higher tax revenues. "At the end of 2015, if we can make these partnerships happen, we create 50,000 new EU jobs," Mr Kalanick said. "Uber wants to partner closely with tax authorities to increase transportation providers' compliance and overall tax revenue for cities and countries across Europe," he added.